The overflow area is on the back-right side of the pond. It's atop an 18" drop (hmmm sounds like it could be a new tune: "Pond Rap") built of earth from the diggings and it levels the pond on a hill. 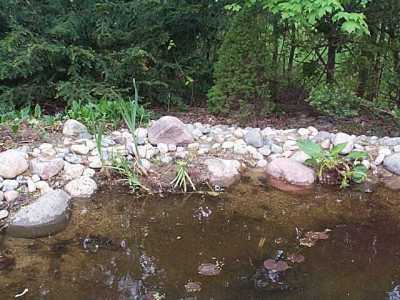 The overflow itself is just more rocks and pea gravel. Because you should protect the liner from ultraviolet rays and the rocks don't always stay put, we placed a couple of layers of plastic sheeting (you can get brown or black) over the liner and then covered the plastic. Down the backside is a "washway" of fist sized stones to minimize errosion. In the water is native cattail and white water lilies. The clay they were in is so dense that it just stays in a ball, even after weeks in the water. The water lilies have survived being uprooted from the old pond, left in an open garbage bag for 9 months, being put in a 20 gallon pond for 3 months and then uprooted and stuck in here for the winter. We guess they're going to live. i know, i know your supposed to have your plants in containers and there's some merit to that but we want as natural a pond as we can get with as little manual maintenance as possible. After having the water lilies overgrow their containers in the old pond, we just let them grow in the pond's sandy bottom and they did very well.